69 yo F is seen for Osteopenia. Patient has a history of breast cancer treated 3 years back. ER, PR status is not known. 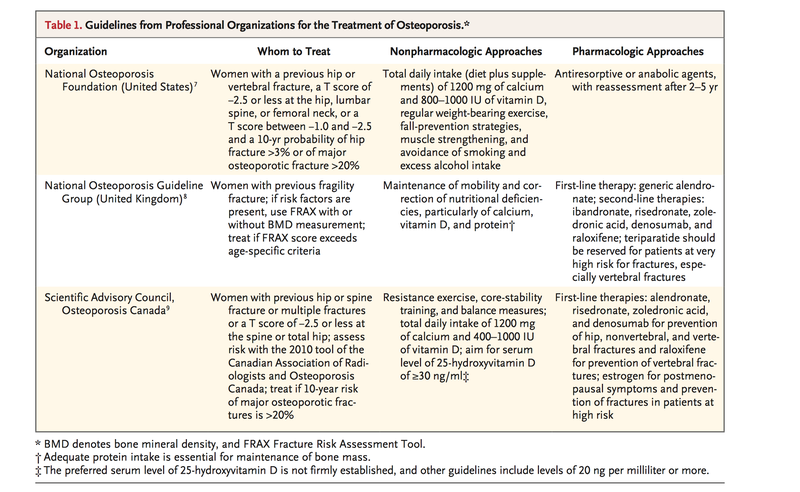 How should you treat this patient along with Ca, and Vitamin D supplementation to prevent Osteoporosis (FRAX score is > 5 for Hip fracture and 12 for Major Fracture). Ans: Given history of Breast cancer, Raloxifen is useful for the prevention of invasive breast cancer. Note: Vitamin Supplementation of 400-800 IU/day leads to appropriate level of vitamin D, even as much as near 70. Disease is characterized by Skeletal fragility and micro architectural deterioration. 95 yo M patient with Pagets disease has ORIF after R Hip fracture. What do you give for the treatment? Teriperatide is wrong choice for 2 reasons. 1. It is an anabolic drug with risk of osteosarcoma especially in patients with Pagets disease. 2. There is no Data of use of Teriperatide when used for prevention of Hip Fracture. 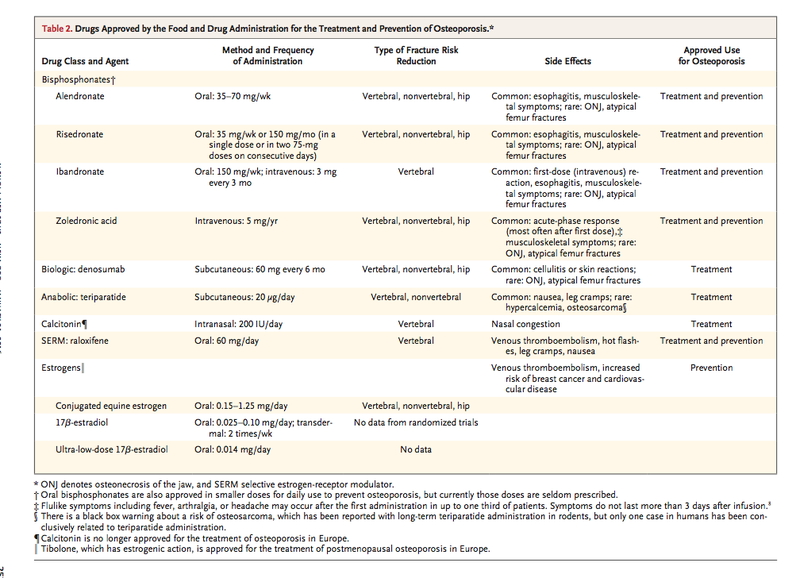 For prevention of GIO, only 2 bisphosphonates are used. Risedronate, and Zoledronic Acid. For recurrent fracture, only Zoledronic acid is used. 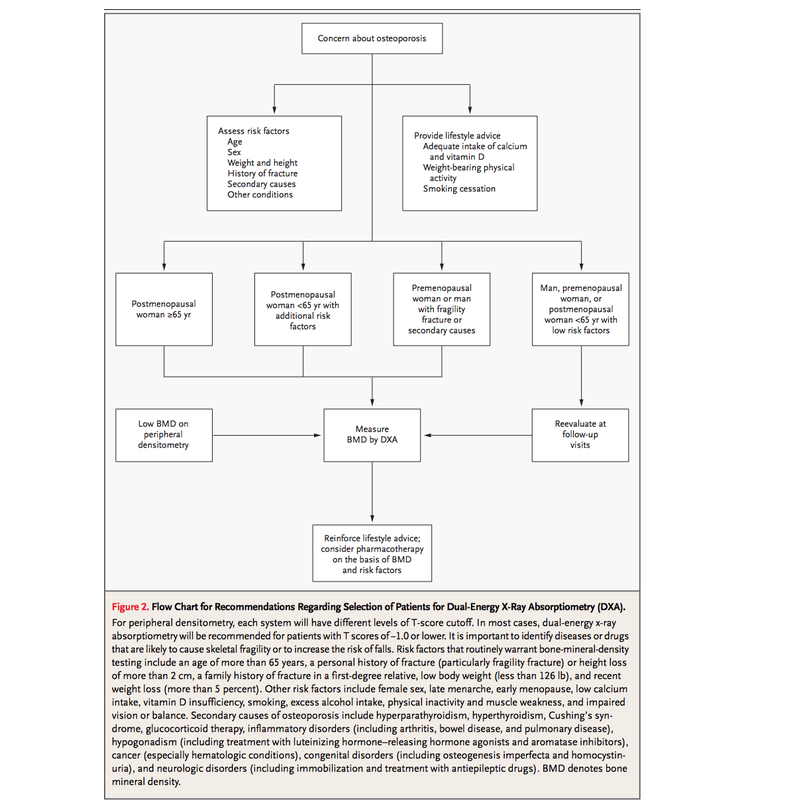 Controversies: Questions of concern from table below compared to NEJM table above. Risedronate for Hip Fracture prevention ?? Alendronate for Non-vertebral fracture ?? 52 yo F with Scleroderma, Raynauds, B12 deficiency is seen for chronic back pain. Patient was diagnosed of vertebral compression fracture. Diagnosis of Steroid induced Osteoporosis was made. Patient was on Alendronate for osteoporosis in the past. DEXA results are as below. CXR shows recurrent vertebral fracture. GFR is 25. Vitamin D is 15. TSH is normal. What is the best treatment strategy in addition to Ca, Vitamin D supplementation? 3. Test for celiac disease. Teriperatide address the decreased bone formation affect of steroids by decreasing the osteoblast apoptosis. Anti-resorptive medication (bisphosphonate do not have this advantage as they work on osteoclast predominantly). Alendronate is not the write answer for it failed to work in the past, but also is not used for recurrent vertebral fracture. 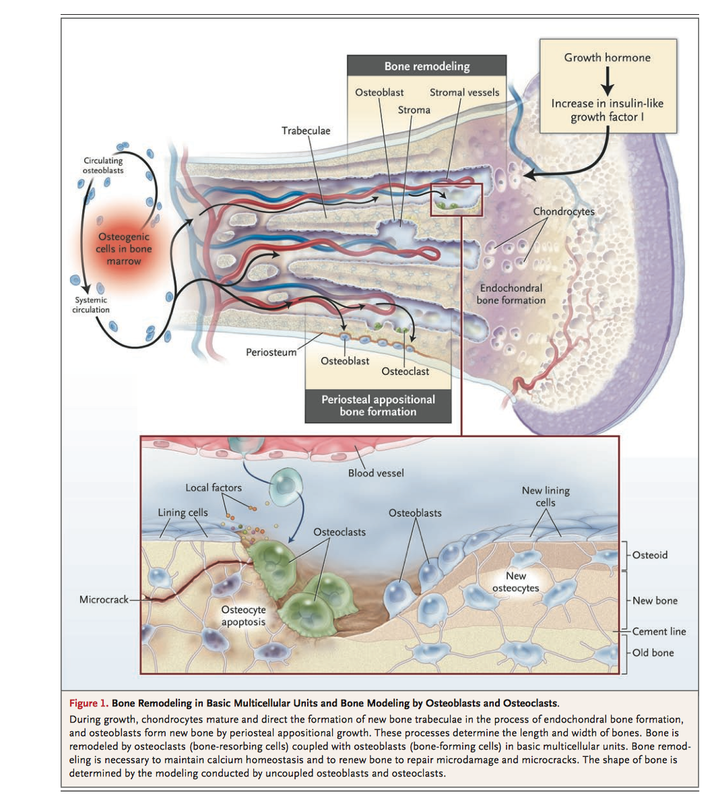 Vitamin D deficiency must be treated before use of Denosumab. 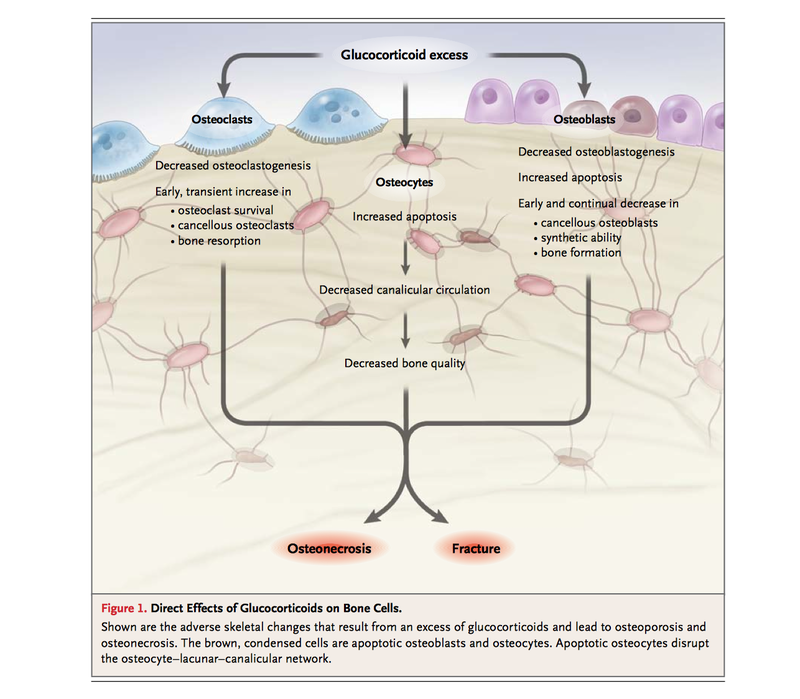 Denosumab also does not address decreased bone formation effect of steroids as it acts on osteoclasts. Alendronate is not used for the prevention of GIO. Risdronate, and Zoledronic acid can be used. 52 yo F with Scleroderma, Raynauds, B12 deficiency is seen for chronic back pain. Patient is on chronic steroid use. 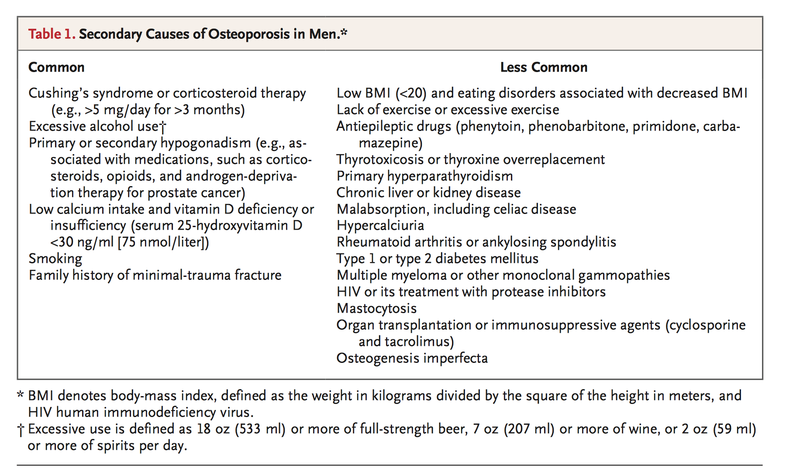 What is the best to prevent osteoporosis. 52 yo F with Scleroderma, Raynauds, B12 deficiency is seen for chronic back pain. Patient is on chronic steroid use. DEXA including hand is done. Shows osteoporosis of wrist. 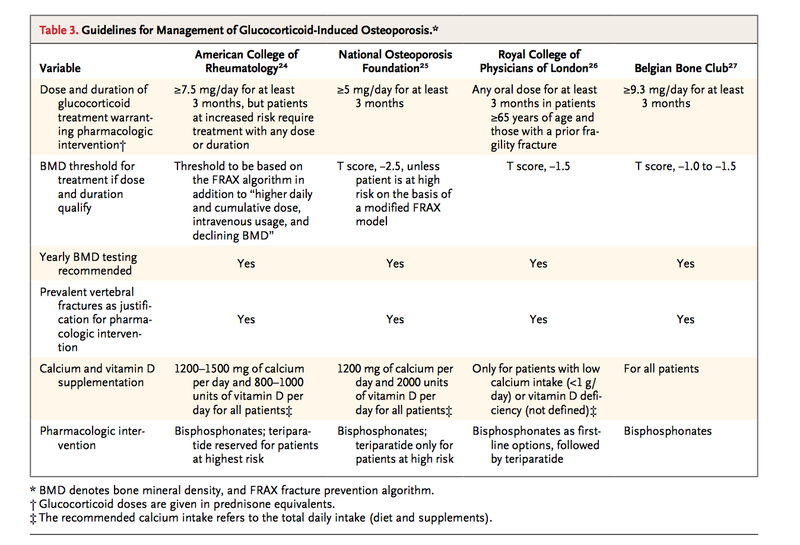 What is the best bisphonate to treat osteoporosis. Ans: Resedronate or Zoledronic acid. Note. 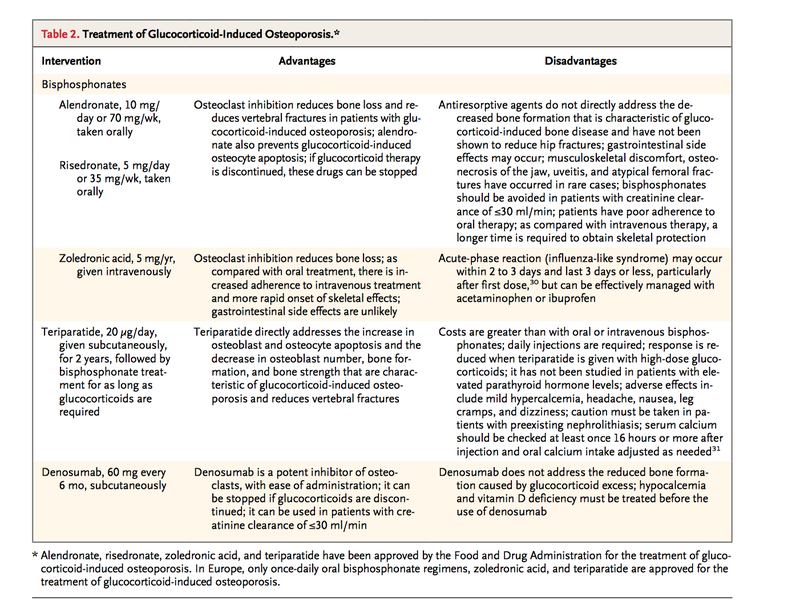 Like in case of GIO prevention Ibandronate (Boniva) and Alendronate (fosamax) are not best for treatment of non-vertebral osteoporosis. 52 yo F with Scleroderma, Raynauds, B12 deficiency is seen for chronic back pain. Patient is on chronic steroid use. DEXA including hand is done. Shows osteoporosis of wrist and hip. What is the best bisphonate to treat osteoporosis. Ans: Zoledronic acid. Note. 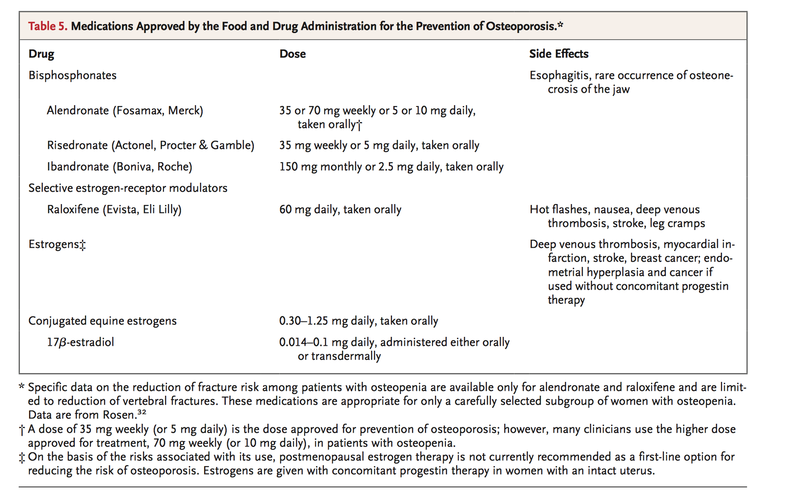 Like in case of GIO prevention Ibandronate (Boniva) and Alendronate (fosamax) are not best for treatment of non-vertebral osteoporosis. 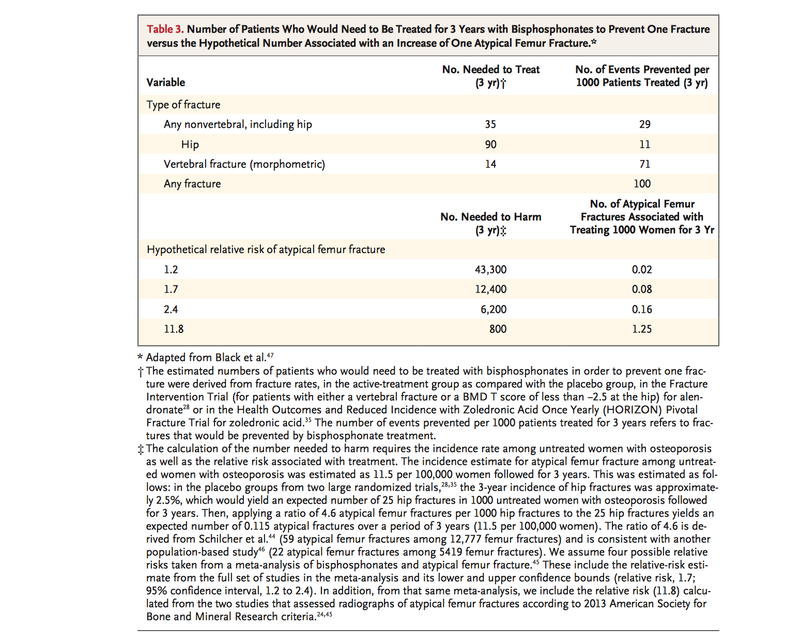 While if it was osteoporosis of Wrist only, Risedronate could have been used, however, is not best for Hip Osteoporosis. Hence, only option in this case is Zoledronic acid. Of-course Teriperatide actually helps counteract the pathogenesis of steroid on bones. 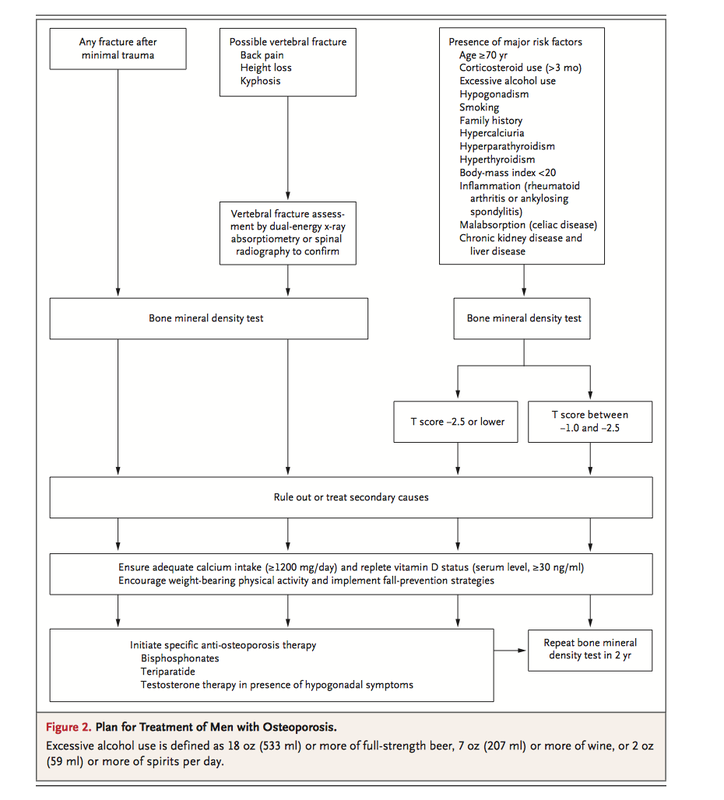 On treatment, if BMD T score decreases from -2.5 to -3.5, risk of fracture is doubled. On the contrary, on treatment, if BMP improves to -2.5 from -3.5, the decrease in fracture risk not only by 50 % but much more. Even as low as 0.1 improvement in BMD in wrist will lead to decrease fracture by around 50 %. However, this analysis did not capture the spinal osteoporosis. When should DEXA be repeated? What should DXA report include? Manufacturar: Hologic, Lunar, Norland. Important that the same machine be used subsequent dexa scan. Images of regions of interest. What testing should an internist obtain in a patient with newly diagnosed Low BM Density? Unclear if inhaled steroids cause it. Some reports say yes, others say no. Prior vertebral (clinical or morphometric - seen in imaging but not clinically - increased 4-5 risk of future fractures), hip, pelvic, humeral, and forearm fragility fracture (irrespective of T score). Falling from standing heights.